Hello, O Internets! GeekCentral is aliiiiiiiiive! Well, kind of. I went looking for photos posted through the years here, on Typepad, and with no luck on Blogger because…and it’s hard to say this…I have lost nearly all my daughter’s baby photos. I know. It’s JUST like that. Only worse. We have had to move servers at home several times, and I only just realized that the majority of my photos I had from my daughter’s babyhood lived on our previous internet provider’s servers, and we somehow forgot to transfer them all over. WOE in our house, I tell you. 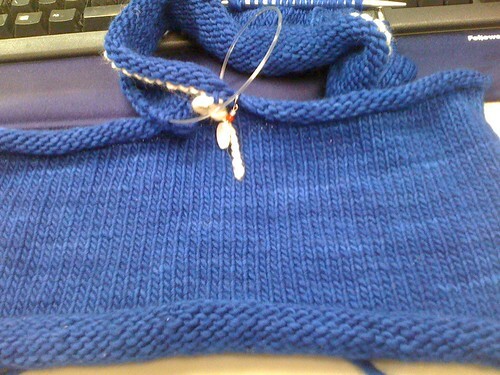 But hey, this is a knitting blog and I am a knitter and holy yarnballs, I HAVE KNITTED!! I went to Rhinebeck and came home nearly empty handed, can you believe that? I got two skeins of Sanguine Gryphon yarn because it was there and kind of impossible to resist, but that was pretty much the sum total of my purchases there. But coming up is the annual pilgrimage to Maryland Sheep and Wool, so all is not entirely lost. It’s also my 9th wedding anniversary on May 4th! I am SO putting that pattern in my queue! Like, right this second! Wow! One of the reasons I am happy about moving is getting back into a climate where things like wool sweaters, hats, mittens, and scarves will actually be useful for something other than moth bait.